Large eddy simulation (LES) is a very attractive method for simulations of reactive flows for a wide range of Reynolds number. In this approach, the effects observed at the large scales (for velocity and concentrations) are directly computed using modelled interactions with the small subgrid scales. Small scales tend to be more isotropic than the large ones, so it is easier to predict their behaviour using simpler and more universal models than RANS ones and called subgrid-scale (SGS) models. 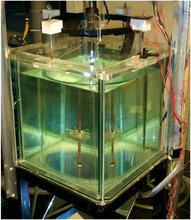 In this work, computational fluid dynamics (CFD) and particle image velocimetry (PIV) techniques have been used to describe the flow field in standard stirred tank equipped with a Rushton disk turbine (RDT). A new efficient and cost effective SGS model called shear improved Smagorinsky model (SISM) for large eddy simulation (LES) has been successfully implemented and validated in the open source CFD code “OpenFOAM”. The shear improved Smagorinsky model is capable of predicting turbulent near wall region accurately without any wall function. The model is based on results concerning mean-shear effects in wall-bounded turbulence. It takes into account the mean shear arising due to anisotropy of the flow. The proposed model, in addition to being physically sound and consistent with the scale-by-scale energy budget of locally homogeneous shear turbulence, has a low computational cost when compared to the original Smagorinsky model and possesses a high potential for generalisation to complex non-homogeneous turbulent flows since no geometrical argument enters in the definition of the eddy-viscosity. However, an appropriate average must be specified in the absence of homogeneity directions. For this purpose we use an adaptive Kalman filter. There was good agreement between the CFD simulations and PIV experimental results.